More than a week ago, I wrote about Raffles Medical Group from the viewpoint of a “Patient” why it is great. Today I will highlight why the company is great from the viewpoint of an “Investor”. To quickly recap, Raffles Medical Group (SGX: R01) “RMG” is a healthcare service provider with mainly hospital and healthcare services. Hospital services include Raffles Hospital in Singapore which contributes 63% of total revenue. Healthcare Services comprise of 78 clinics in Singapore and 4 medical centres in Hong Kong and Shanghai. Together with healthcare insurance, nutritional supplements and diagnostic equipment, this segment accounts for 34% of total revenue. RMG is one of the darlings in the stock market this year. 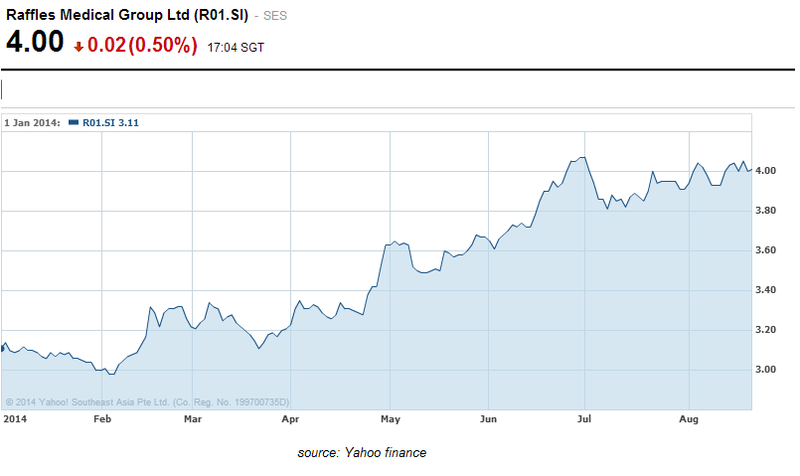 The company share price escalated 29% to S$4.00 since the start of the year. In contrast STI increase was approx. 5% year to date. 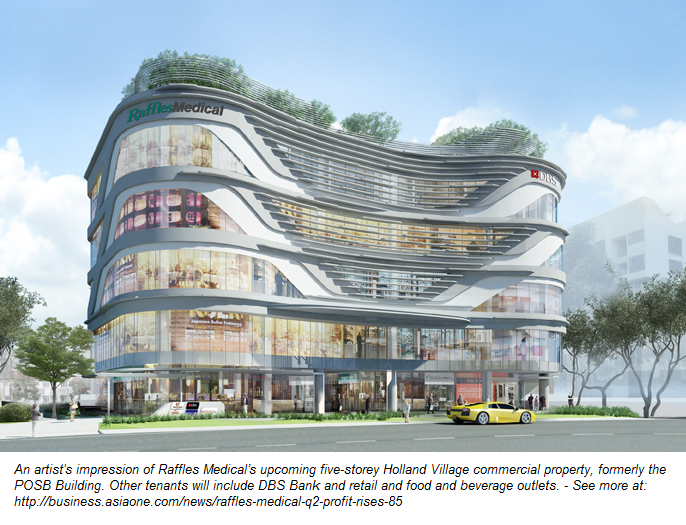 In its latest quarterly result announcement ended June 2014, Raffles Medical Group’s 1Q14 revenue grew 6.6% to S$92.6m while earnings flourished with an 8.5% increase to S$15.6m yoy. 1H14 performance were equally strong demonstrated by top and bottom lines growth of 7.3% to S$180.2m and 8.1% to S$30.3m yoy respectively. In the interest of shareholders, the company declared a 50% rise in interim dividends from S$0.01 per share a year ago to S$0.015 per share. As of 30 June 2014, the company’s balance sheet had cash of S$130.6m and debt of S$5.2m, even after the investment of more than S$190m on the purchase of property, plant and equipment since the start of 2014. The year ahead seems optimistic thanks to additional growth from opening of new medical centres. Within core central regions, the group opened a brand new comprehensive medical centre at Marina Bay Financial Centres, which will be offering a wide range of services to patients within the downtown business hub. Outside core central regions, RMG added dental facilities at White Sands, Bedok Mall and Jurong Point. It also opened a new Yew Tee Point clinic in January 2014 to cater to a new population region in Singapore. Raffles Hospital also saw the addition of state-of-the-art medical technology recently with the introduction of its new nuclear medicine centre on 21 July 2014 to enhance the hospital’s cancer diagnostics and treatment capability and concurrently increase its capacity for advanced imaging modalities. Last year, RMG announced plans to open hospitals in Shanghai and Shenzhen in Feb and Sep respectively. There were no news since then, but if these negotiations are successful, it will allow RMG to expand its operations overseas and diversify its geographical client base. With an extensive network of clinics in Singapore as well as a hospital, RMG is expected to benefit from the Community Healthcare Assist Scheme (CHAS) and Medisave alterations announced/implemented by Singapore government. 1) Extension of Raffles Hospital which could potentially add 220k sqft to the existing 300k sqft of gross floor area for the hospital. The total development cost, including the purchase price of the adjacent site, construction costs and improvement works to the existing hospital, is estimated to be approx. S$310m in addition to the S$105m purchase consideration. 2) The construction of a 5-storey commercial building in Holland Village, having 65,000sqft of gross floor area with medical, banking (DBS), retail, food and beverage services. The construction started April this year. It is estimated that the cost of redevelopment, including construction costs, development premium, stamp duty, property tax and interest expenses, will amount to approx. S$65m in addition to the S$55m purchase consideration. Both developments are expected to be completed sometime in 2016. Just when everything appears extremely bright for the company, there are always two sides of a story. As much as RMG has anticipated possible increased demand of healthcare services in the face of Singapore aging population, its competitors had all geared up too. Many hospitals and medical centres, both private and public, will be rolled out from now till 2020. Eminent threat should arise from the higher subsidies from government and rising cost of living prompting Singaporeans to switch from private to public healthcare services. Moreover a portion of RMG clients from Indonesia will be deterred from crossing the border to seek for healthcare services due to the depreciation of their currency. Official data shows the rapid rollout of new private and public hospital beds in 2014-20, after the completion of the 220-bed Farrer Park Hospital this year and five new public hospitals. In addition, a slew of private medical suites will be completed in the next few years. They are currently being marketed. Other than Connexion, which we have been flagging, at least three other integrated developments housing medical suites are being built. These are Farrer Square (42 strata units) next to Connexion at Farrer Park, Royal Square in Novena (171 strata units), Vision Exchange in Jurong East (53 strata units) and Mediplex@SBF Centre (48 strata units). Please also refer to “Straits Times Feb14 News here” for a list of new hospitals in the pipelines. In particular Ng Teng Fong General Hospital at Jurong reported this month that it is facing delay of six months in its opening to mid next year. Without doubt, the two development projects at North Bridge Road and Holland Village could potentially boost revenue once completed. However the total cash outflow for the capital investments is about S$535m for two years. Having already paid S$190m and currently holding S$130m cash, there is still a shortfall of S$200m and more. Without any direct injection of funds, RMG may resort to borrowing money to pay for it all. Similarly any new hospital expansion overseas (China) in the short term will also require leverage in a rising interest rate environment. Since inception, RMG leader, Dr Loo has been instrumental in the company success. Dr Loo is already in his mid-sixties and the need the right successor can be critical. At its current price of S$4.00, RMG price to earnings ratio is valuated at 25 times trailing earnings which is not at all cheap. Then again in the long run, the overall demand for healthcare services in Singapore is still bright in the face of an ageing population. Why is Raffles Medical Great? – A tale of personal experience! A good and detailed analysis of RMG. I have been monitoring this for a few months now. But personally feel that the price is on the high side. But, nevertheless, it may not be to other. What will be the valuation you had on RMG? BTW, I'm also new to blogging and had added your blog in my blogroll. You can read it here. All the best in your investment and health! Thanks for the comments. I have to apologise for the late reply as I am only back home from overseas last night. I agree at 25x PE, RMG is not cheap when comparing to stocks in general. But when comparing to competitors, it is not too high or even quite low. 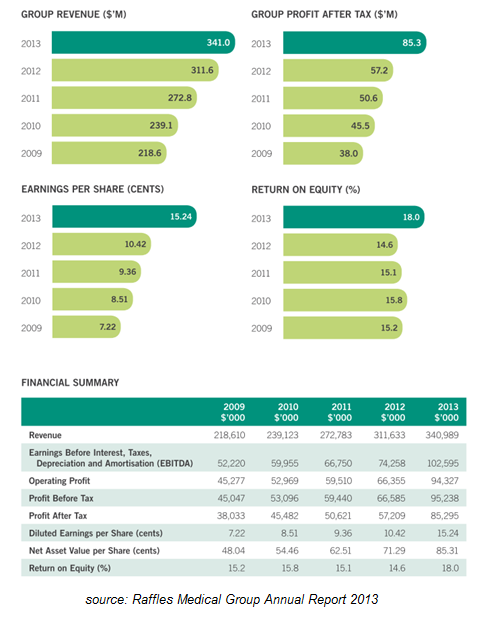 In fact in 2013, RMG’s PE is even higher at 30x. That is the time when I bought in. IHH Healthcare 53.1x, Health Mgmt Int 37.9x, Bangkok Dusit Med (TB) 41.7x, Bumrungrad Hospital (TB) 34.9x, KPJ Healthcare (MY) 31x etc . Average PE of the industry in 2013 is 38.2x. 2014 average PE estimate is 33x. Therefore it is subjective to decide if RMG is expensive. We may want to take into account its growing prospect too. For me, other considerations may include if there are better other stocks around, how I want to diversify my portfolio etc etc. Your call eventually! . By the way, thanks for adding me to your blogroll. I added yours as well here. Welcome to the Singapore blogging world! Wish you good health and wealth too! Will take a closer look on RMG and hope to find a good reason soon. Great analysis on Raffles Medical. Good that you can include both your own personal experience as well as the facts and figures into your overall investment framework. Although many could have felt that the price currently is perhaps slightly on the high side (not sure how at what price you've entered), I believe you have an edge there due to your own involvement as a customer of the company. Thanks for the compliments. Involvement as a client is little now. 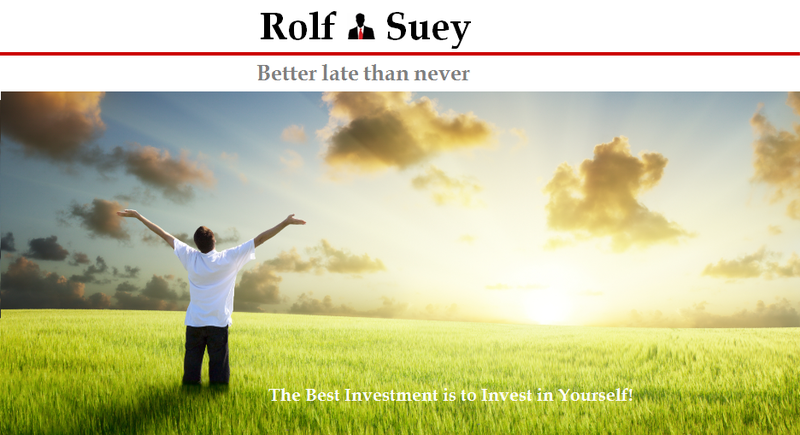 It is a bad thing for investment, but good thing for my health. Haha. I entered at low 3 and hi 3 different lots each time. Actually I am attracted by the Bugis extended hospital and the Holland V new facility plus strong balance sheet. Also I classify RMG in my long term category of stocks. RMG price is expensive to many. To me, price is fair, though not cheap. Anyway the price had been increasing steadily from 2-2.5 in 2012 to 2.5-3.5 in 2013 and 3-4 in 2014 with respect to earnings. IHH Healthcare 53.1x, Health Mgmt Int 37.9x, Bangkok Dusit Med (TB) 41.7x, Bumrungrad Hospital (TB) 34.9x, KPJ Healthcare (MY) 31x etc . Average PE of the industry in 2013 is 38.2x. 2014 average PE estimate is 33x. Now RMG is 25x PE. That is just my opinion.  can be wrong definitely. You analysed RMG before in detail like what you did for SCI? By the way, you heard about ISEC? Another new interesting healthcare company. Your entry price seems good and I believe you've made some decent unrealized profits there. I did look at it some years back and I agree that RMG is indeed a good quality stock. However, if I were to purchase at current prices, I will have some concern with the price paid. On a relative basis, when compared to other competitors it looks quite reasonable. However, on an absolute basis, I think a P/E of 25x is a bit too high for me to stomach. My self-imposed limit for a very high quality company is 18-22x. Moreover, the P/E used is based on the latest earnings which also happens to be the highest in 5 years. Although there may be growth prospects, we can never be sure whether these supposed growth can still exceed its cost of capital in the future. If we were to use the earnings for 2012 which is the 2nd highest in the said period, the P/E becomes 37x. I think I mentioned before, I am not good in detail analysis. I am better with people and use of gut feelings base on work experience. I think you got most of the analysis correct, and all reasons stated are very relevant. I also learnt one phrase from another fellow blogger SMOL "Different strokes for Different Folks!" Very well-said - "Different strokes for Different Folks." Detail analysis is the easy part while people and gut feelings based on experience is the hard part. You've mastered the hard part and I ought to learn from you. I do not agree with you. Detail analysis is more difficult. People and gut feelings are just crap! The most "powderful" word I learn from another blogger is "DYODD" i.e. do your own due diligence. LOL. Let's continue to enjoy ourselves here in the blogspace. Great year ahead for you.